The four holes in the plate are original and are for attaching a square fly-paper, as is shown in a newspaper advert for Mather's fly-papers. The back, printed with an advert for "MATHER'S ROYAL BALSAMIC PLAISTERS / AS SUPPLIED TO THE / ARMY AND NAVY AT SCUTARI HOSPITAL. Sold at 1d, 2d, 3d, 4d, 6d and 8d each by / all Chemists." The illustration shows a man apparently with a chest wound. Below is another advert for "MATHER'S IMPROVED INFANTS FEEDING BOTTLES." The hospital at Scutari became famous during the Crimean War when Florence Nightingale set about changing the nursing regime there and became a celebrity. 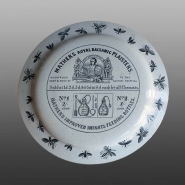 An earthenware plate printed underglaze in black with an advert for fly papers: "MATHER'S PATENT FLY PAPER PLATE / to hold / MATHER'S Chemical Fly Papers / for poisoning / FLIES, ANTS, MOSQUITOES. / Sold by all Chemists Everywhere. / W.MATHER / 14 BATH STREET / NEWGATE STREET LONDON E.C. / 19 HANGING DITCH & 109 CHESTER ROAD MANCHESTER / MANUFACTORY / Trentham St / HULME / MANCHESTER." Below are printed a Design Registry mark for 1867 and a version of the arms of Mather, including the motto of the Scottish branch of the family, "Fortiter et Celeriter."